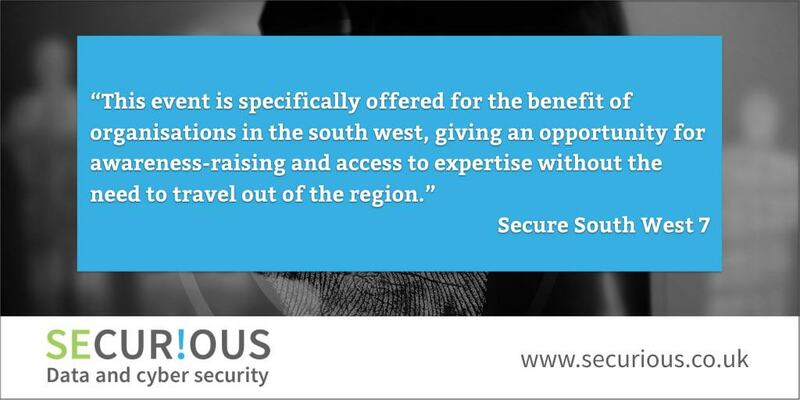 Securious are delighted to sponsor the Seventh Secure South West event to be held at Plymouth University on the 5th October 2016. The event is jointly organised by Plymouth University and Plymouth City Council, and is supported by the south west branches of BCS – The Chartered Institute for IT; the Institute of Information Security Professionals; and South West WARP. There are six presentations by experts from industry and academia, followed by a panel session as follows. Stand and deliver! Your money or your files! Previous Secure South West events are very well attended and can be viewed at Secure South West website which includes videos of previous speakers on a diverse range of subjects relating to cyber security. All events have been of very high quality and are a ‘must’ for any one interested in updating their knowledge. Registration is free to delegates but there is an option to make a voluntary option of £30 towards event costs which includes refreshments and lunch.